So I got my son a S4 for Christmas, it seemed to be working fine before I wrapped it up, though I just turned it on, activated, made a call, and turned it off. Wrapped it up for the big day. My son gets it out of the package, turns it on, puts it in his pocket. Over the next week he complains that the phone turns off all the time. I check it, charge it, turn it on work with it a minute and it turns itself off. Repeat about a dozen times, and I assume it needs a new battery. I install new battery, boot up, put on charge to 100%. Take it off charge and within 3 minutes it shuts off. I get it back on (It wouldn't just turn back on), stays on about 10 minutes and shuts off. I do a factory wipe/reset. Now on boot I get the Freedom Pop logo with moving white ball, I left it over night for 7 hours. Still the same screen when I got up. Power off, change chargers, turn on and Freedom Pop logo with moving white ball again for the past 7ish hours. You should use kies to restore the phone to stack and reinstall the fp apps. Where do I go about getting the fp rom to restore it with? or any other rom? I got the phone from Freedom Pop, so imply I have quite a bit of knowledge by saying to use kies and restore to stock. Samsung S series are know for turning off in the pocket(especially with a case) or any enclosed spaces when tight. The reason is the location of the power button. I use Samsung with my 3 kids and this is very common. Not sure if this is your issue, but it maybe. Also on certain occasions, we will get the same screen on boot up. Normally we just pull the battery and wait a few minutes, and boot back up and we are fine. 2) Remove the battery and reinsert. 4) Press and hold the Power button while still holding the other keys. 5) As soon as you see the Samsung logo, release all keys/buttons. 6) Press on the Volume Down to scroll down to Wipe Cache Partition. 7) Press the Power button to select it. 8) Press the Volume down button to highlight "Yes" and press the Power Button to select it. 9) Wait for a few minutes for the phone to clear the data. 10) Then press the Power button to select reboot system now. Yeah thanks, the phone was not a MOTOROLA phone, so I have no idea why you would suggest loading a MOTOROLA rom on the device. Besides, this phone came from Freedom Pop, I shouldn't have to be loading roms or anything. 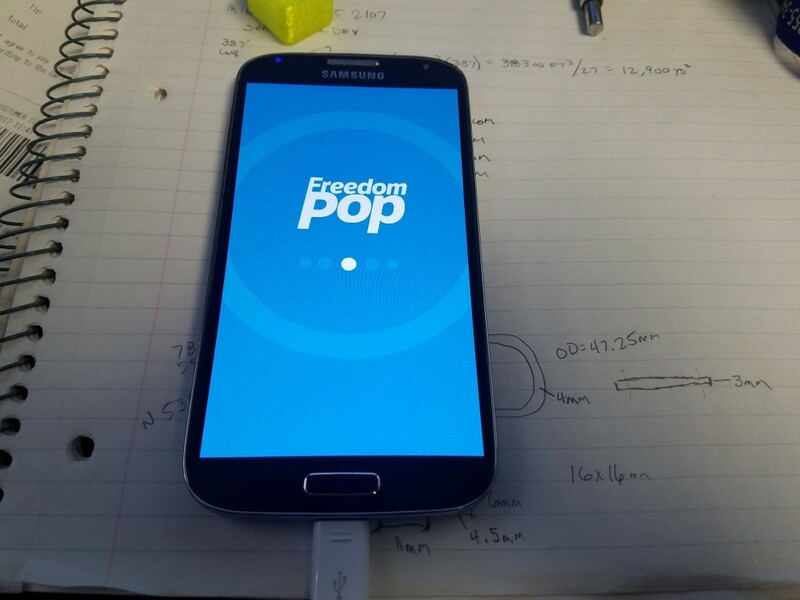 Update to the situation: Freedom Pop has issued me an RMA for a swap, so hopefully I will have a working phone soon. Oh, that was my autocorrect and the stupid swipe feature on my note 4, your phone was rooted and the custom rom that FreedomPop uses wasn't loaded correctly.